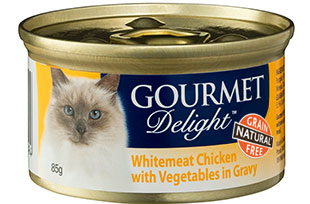 Gourmet Delight premium cat cuisine, is proud to be natural as nature intended. 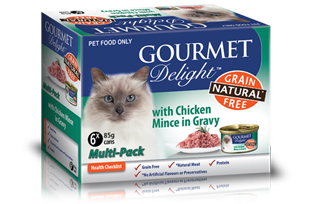 GRAIN FREE with REAL NATURAL meat & fish and containing no artificial flavours and preservatives its a healthy gourmet meal. 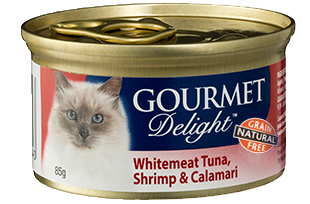 Available in a range of delectable fish & meat flavours there is something to suit the fussiest eaters. 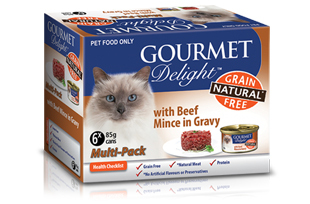 Delight your loved one with gourmet natural cat cuisine. 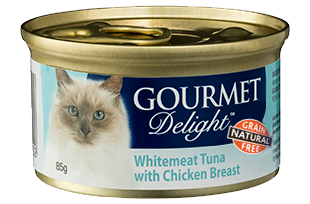 Meat And Meat By-Products (Derived From Chicken And/ Or Beef And/ Or Fish), Thickeners , Vitamins And Minerals, Colours, Gelling Agent. 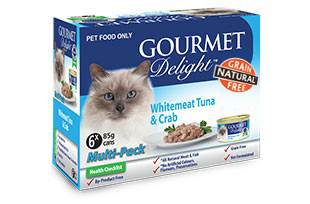 Tuna, Gelling Agents, Crab, Surimi, Soybean Oil, Vitamins & Minerals, Taurine. 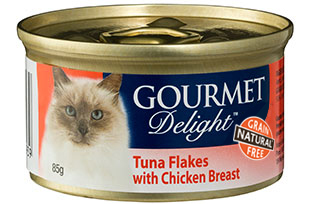 Tuna, Chicken, Thickening Agents, Vitamins & Minerals, Taurine. 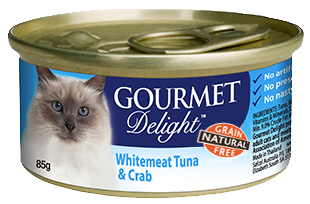 Tuna, Calamari, Gelling Agents, Shrimp, Soybean Oil, Vitamins & Minerals, Taurine. 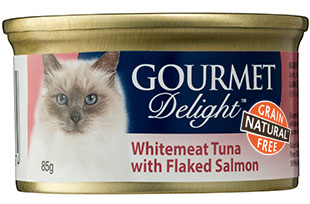 Tuna, Salmon, Thickening Agents, Vitamins & Minerals, Taurine. 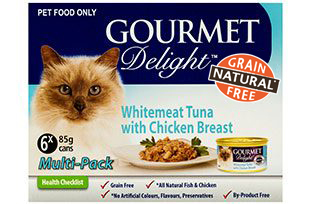 Tuna, Chicken, Gelling Agents, Soybean Oil, Vitamins & Minerals, Taurine. Chicken, Surimi, Carrot, Pumpkin, Thickening Agents, Vitamins & Minerals, Taurine.